Clay flowers have become very popular nowadays as they are non-toxic, non-allergic , eco-friendly and gorgeous . 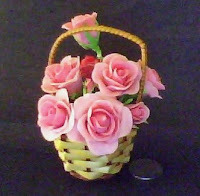 These handmade roses are made of cold porcelain dough which is also known as Lamasa, Spanish Clay, Thai Clay and other branded names . No cutters, tools have been used as I prefer making roses totally with my hands .